Two days ago, the company expanded its voluntary recall to include all the peanut and almond butter products it makes. Now the remaining Cashew Butter, Tahini and Roasted Blanched Peanut Products, which are also manufactured at this plant, are being recalled too. According to the latest information from the U.S. Centers for Disease Control and Prevention, 30 people in 19 states have been sickened by a strain of Salmonella called Bredeney. Four people have been hospitalized so far, but no one has died. The reported illnesses occurred between June 11 and September 11. Nearly two-thirds of those sickened are under the age of 10. Young children, the elderly and those who are already sick or chronically ill are more susceptible to severe illness if they become infected with Salmonella. This company says the recall applies to the all products manufactured at this plant with a "best if used by" date between May 1, 2012 and September 24, 2012. Consumers can find this date stamped on the side of the jar's label below the lid of the jar. Coburn tells CNN that there has been "no link to any specific product," but rather 14 of those sickened had been interviewed by health officials and 12 of those people recalled eating Trader Joe's peanut butter. She says that's "the reason for this entirely preemptive and voluntary recall." The CDC has reported that 12 of those sickened indicated that they ate Trader Joe's Valencia Creamy Salted Peanut Butter made with sea salt and that this is a likely source of the outbreak. Since this is an ongoing investigation, the FDA will not comment on specific details, according to a spokeswoman. Consumers are urged to dispose of any remaining jars of Sunland, Inc., products in the home or return them to the place of purchase. A full list of all voluntarily recalled products can be found here. Consumers can also contact Sunland by calling 1-866-837-1018 for more information on the recall. Is there anything safe out there that we can eat with getting sick? No. It's time to go back to raising our own food. Tens of thousands of people get sick every year from eating contaminated, processed, or old food ... from supermarket eggs (up to three months old by the time you buy them) to meat. One of the big issues is cooked meat and fish next to raw meat and fish on supermarket counters–an illegal practice in other countries because of the risk of cross-contamination. Buy fresh and local and prepare your own food–costs more, but most of us can balance that out by buying and eating less (and being healthier all around). 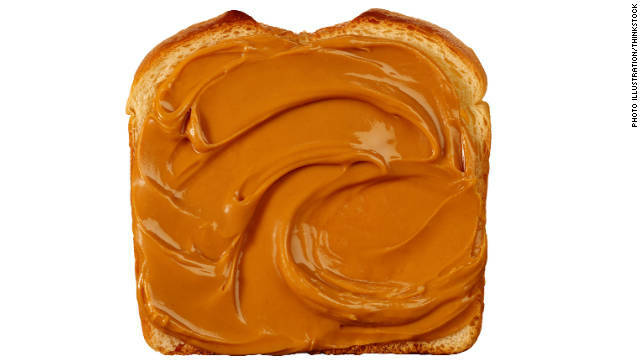 Want peanut butter–buy roasted peanuts in the shell, shell them, and stick them in a blender. Then you have peabut butter without the added sugar and other garbage that's added as filler by the commercial companies. And by the way CNN, the primary meaning of the word "sickened" is "disgusted" or "revolted" so using it talk about someone becaoming ill through a bacterial infection isn't the best writing. Yes, Yes, Let the salmonella flow through you. I've been buying from Sunland Peanuts since 1994. I buy gifts for Christmas from them because everybody loves their organic peanuts and the organic peanut butter and dark cholcolate is to die for it's so good. Last year, I brought the yellow mesh peanuts to our staff meetings in Battle Mountain, NV and after they were gone, people asked me to buy more. I've know the owner, who donated plenty of peanut bags for us to sell to support programs at Cannon AFB. I've been to their plant on several ocassions and the cleanliness is undeniable. It is unfortunate that contamination occured, but that is something that can happen to peanuts while they grow. Don't shun this wonderful company. They are clean to a fault. Also the way they roast their peanuts is perfect. There isn't one over roasted, burned tasting peanut that I've tasted. It's done to perfecvtion. I'm sure they are doing everything to assure that people don't get sick. I think about higher education quite a bit. Senior year will go by really fast, so I am seeking to figure out what I need to do now, she mentioned. "I've been getting a ton of information and facts inside the mail about schools that I am into and possess previously visited Muskingum (College or university) and Otterbein (College or university). These are only a pair of faculties I am pondering."